Here’s a list of 5 essential tools every apartment needs! When moving into a new apartment for the first time, you realize that you end up needing a lot of things you may have never thought to buy. 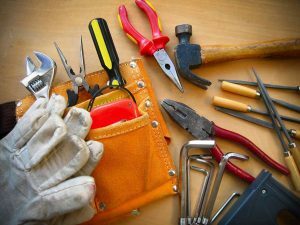 Some tools always just seemed to be around when you lived at home, and you may forget a few tools you should have in your new apartment. To save you some time and money, we’ve compiled a list of a few of the essential tools every apartment needs! You may think that you’ll be able to hang up decorations and photos in a straight line, but those who have tried know that it’s harder than it looks. Levels come in handy to ensure that everything is hanging correctly and evenly, and can even help with sloping floors or unlevel stovetops. Superglue comes in a few different names and brands, but all works the same and is a must-have for every apartment. It can repair most materials and is great to have when something unexpectedly breaks. Instead of throwing away a broken glass or plate, superglue may be able to fix the problem and save you money. It even works on shoes and clothing, so it really can save the day! Duct tape was likely a staple item in your childhood home, but you may forget to buy it for your new apartment. Duct tape really can solve most problems and is very cheap and easy to find. It is extremely durable and can repair most items and materials, and is one of those things you should always have on hand in case of an emergency. A tape measure is essential on move-in day and is even helpful when bringing it on the day you first visit the apartment. Before moving in, it’s helpful to know the width of the doors and hallways and staircases. Whenever you need to buy new furniture, a tape measure is crucial for deciding which pieces will fit through your front door and in the room. No home is complete without a plunger! Hopefully, it won’t have to be often used, but it is a lifesaver when it is needed. This entry was posted on Friday, February 2nd, 2018	at 4:48 pm	. Both comments and pings are currently closed.